Islamic violation of Human Rights and attack upon minority Hindus in Bangladesh severely opposed in HR Day. Human Rights day: Discrimination and persecution upon Minority Hindus in Bangladesh condemned in Dhaka, Bangaon and Kolkata. Upananda Brahmachari | HE Media Bureau | New Delhi | 11 Dec 2013:: On the Human Rights Day on 10th December, various Rights Groups and Hindu organisations opposed the discrimination and persecution upon Minority Hindus and other religious minorities and conducted various programmes in Dhaka, Bangaon and Kolkata. 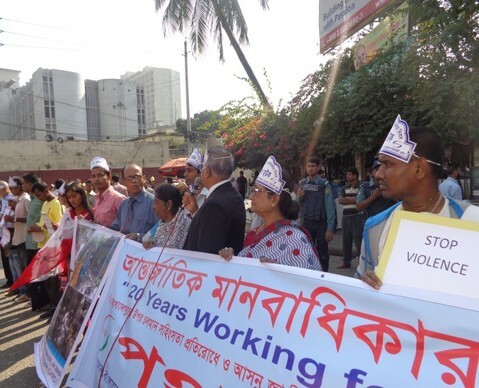 Bangladesh Minority Watch (BDMW) – Global Human Rights Defence (GHRD) and Bangladesh Center for Human Rights Development (BCHRD) jointly organized -Discussion Meeting – peaceful demonstration and awareness programme on International Human Rights Day-2013 in front of National Press Club-Dhaka-Bangladesh with a centralized theme to alleviate the tantamount attack and humiliation of Bangladesh minority people, mainly Hindus-Buddhist and the Christian people there. The program was marked successful as more than 100 participants including minorities from various parts of Dhaka and Narayongonj District attended the meeting with festoon and placards to mark the day despite Hartals (strikes) called by Jamat-E-Islam at Dhaka denouncing the death sentence of Abdul Kader Mollah passed by the Appellate Division of the Supreme Court of Bangladesh. Hindu minorities are presently at a stake and fleeing from Bangladesh to seek refuge in neighbouring India through the present turmoil in Bangladesh between Awami League and BNP after the pronouncement of some death sentence for the War Criminals in BD. In the demonstration the speakers said that Bangladesh must stop all the violation of Human Rights towards the minorities and must ensure to bring back the 1971 Constitution for the healing of the fractured Human Rights in BD so far. Monoranjan Ghoshal – the Freedom fighter & renowned singer of Bangladesh Radio, Advocate Rabindra Ghosh-President of Bangladesh Minority Watch (BDMW) , Advocate Rana Das Gupta-Prosecutor-International Criminal Tribunal and Secretary-General of Hindu Bouddha Christian Unity Council, Mohammad Abdul Khaleque- President- Biswa Bangalee Convention, Dr. Gopal Debnath- Professor of University, Advocate Prodiwp Saha, Ms. Anita Paul-Social Organizer, Manik Chandra Sarkar-Secretary of BDMW-Narayangonj, Ganesh Rajbongshi, Mahabul Hoque –BCHRD , Shamsul Alam Chowdhury and many others were present and delivered their speeches on the importance of Human Rights Day concerning religious minorities. Most of the speakers stressed upon the urgent need of establishing good governance and democracy. Some specific demands were raised and highlighted for ensuring voting rights of vulnerable groups. Protection Rights of HR defenders and minorities were discussed. Leaflets concerning human rights issues ensuring equal participation of minorities in the ensuing national election in Bangladesh, were also distributed and exhibited. 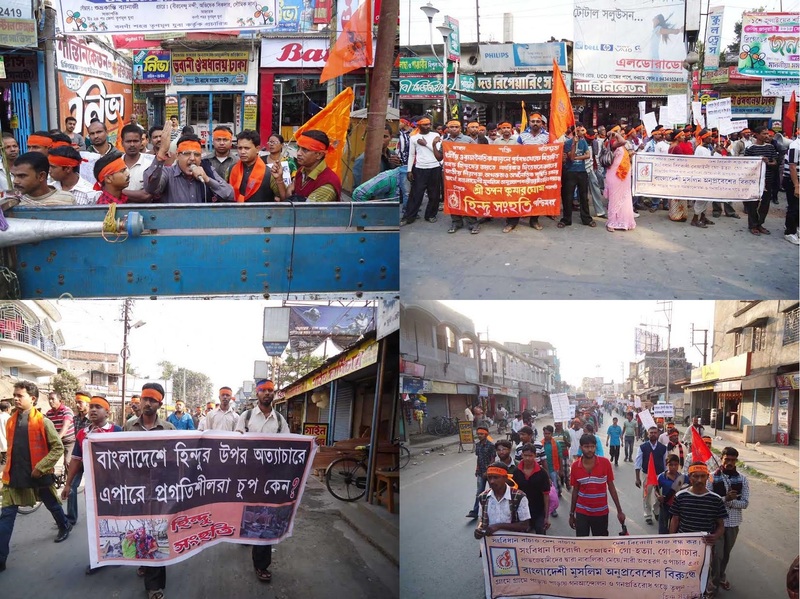 Hindu Samhati, a Hindu organisation working mainly in West Bengal, took out a big protest rally against Persecution of Hindus by Fundamentalist Muslims in Bangladesh. Bangaon is a sensitive border town on the India-Bangladesh border in N 24 Parganas District of WB. Though police refused to give permission to Hindu Samhati’s rally, the protesters thronged in good number. Some criticized that the WB police and their direct controller Chief Minister, Mamtaz Banu Arjee, are supporters of Jamaat-e-Islami & BNP of Bangladesh and behaving like Islamist. As a matter of fact, the Rally set to be nullified to avoid any displeasure the fundamentalist Muslims here in West Bengal. Hence, the ruling party, Trinamool Congress (TMC) put all hurdles to obtain the permission from police. Therefore, under a culpable instruction from the TMC leaders, Bangaon police refused to give the necessary permission to hold our rally. However, Hindu Samhati activists were ready to face any consequences only to show solidarity with victimized minority brothers and sisters of Bangladesh. Rights Activist Animitra Chakraborty, Advocate Brojendra Nath Roy, Bikarna Naskar, Nisith Ghosh, Abhijit Mishra, Sushen Biswas and other key persons of the organisation attended the rally. 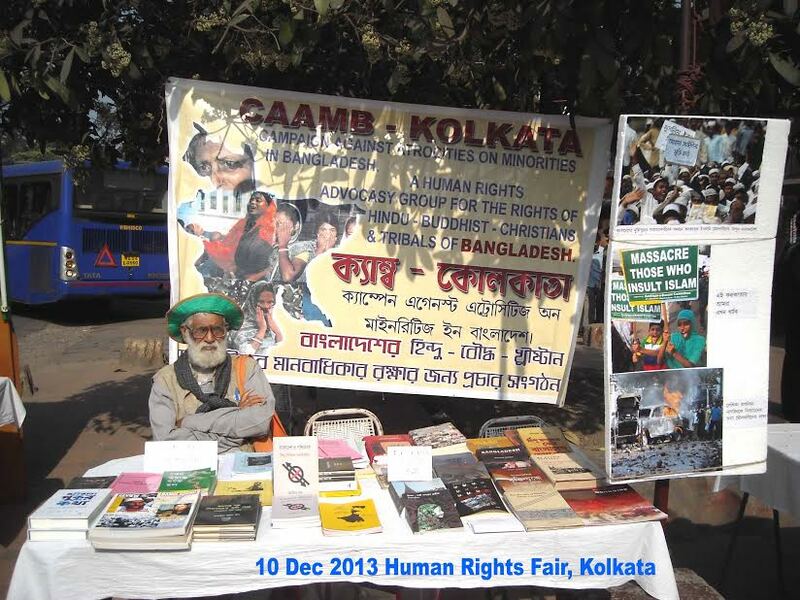 The Campaign Against Atrocities on Minorities in Bangladesh (CAAMB), a Kolkata based human rights organization that campaigns against human rights violations on minorities and liberal thinkers in Bangladesh put a small book stall in front of Acadeny of Fine Arts, Kolkata at Human Rights Fair, 2013. The books mainly on Human Rights and the Works on the matter of Rights Violation of Minorities in Bangladesh were displayed in the stall for both sit-on-reading and sale. Some books from Bangladesh by eminent authors like Salam Azad, M A Khan, Humayun Azad, Shariar Kabir were the main attractions of the stall. The books, written by Rabindranath Dutta (born in Bangladesh -settled in West Bengal) on Bangladesh Hindu Genocide and Plight of BD Hindus, were also sold in good numbers. As before, CAAMB activists distributed leaflets highlighting the plight of Bangladeshi Hindu and other religious minorities with a request to the present Govt of BD to stop attack on them in various parts of Bangladesh by the fundamental Islamist belonging to some political parties. In a discussion forum, Mohit Roy, Rabindranath Dutta and other dignitaries of CAAMB interacted with the interested people to do something for the cause of dying religious minorities in Bangladesh. Courtesy: BDMW | SDF | CAAMB. This entry was posted on December 11, 2013 by hinduexistence in Attack upon Hindu Temple by Muslims, Attack upon Hindu-Buddhists by Muslims, Attack upon Hindus by Muslims, Bangladeshi Hindus, Conspiracy against Hindus, Hindu - Buddhists attacked in Bangladesh, Hindu Genocide in East Pakistan (now Bangladesh), Hindu Leadership Under Attack, Hindu Protest, Hindu Tradition and Culture under attack, Hindus under Islamic Aggression, Islamic Menace, Minority Watch in Bangladesh, Persecuted Hindus, Religious Rights of Hindus, Save Bangladesh Hindus - Buddhist - Christian - Minorities, Save Bangladeshi Hindus, Violation of Hindu Human Rights in Bangladesh, Violation of Hindu Religious Rights, Violation of Hindu Rights and tagged Atrocities upon Hindus in Bangladesh, atrocities upon minorities in bangladesh, Bangladesh Minority Watch (BDMW), Bangladeshi Hindu, Bangladeshi Hindu Minorities, Global Human Rights Defence (GHRD), Hindu Samhati, HUMAN RIGHTS, The Campaign Against Atrocities on Minorities in Bangladesh (CAAMB).